I love adding to my 101 Reasons I Love My Husband posts. Each time I go back and read my previous posts, I am reminded of just how blessed I am. Today’s blessing: God has given my strong, sweet man the ability to know when I need a hug. I don’t mean one of those quick squeezes. I am talking about one of those long, tight hugs that makes the rest of the world and it’s troubles fade away. The kind where you disappear into his chest and feel safe. There are times when I am feeling beaten down by my day or times when I am a little overwhelmed, and he will stop everything we are working on and grab hold of me. In that hug God speaks to me and I feel loved and safe and re-energized. I can once again take on the world. Have you hugged your sweetie today? Don’t forget to enter in my latest giveaway- Baltic Amber jewelry from Spark of Amber! Let me tell you what Mr. Muscles just did. The kids and I have spent the better part of the morning hanging up laundry and working in our veggie garden. We came in to cool off and I discovered something beyond wonderful. The man CLEANED OUT AND ORGANIZED OUR CABINETS INCLUDING OUR PANTRY CABINETS. Seriously. They are cleaned out, organized and they make sense! This speaks to my working-ever-so-hard-to-organize-the-whole-house heart. Did I mention while he was cleaning he was on Little Detail (with Little Man- 4 mo, Ms. Dimples- 2 yrs, and Ms. Giggles- 4 yrs) while the big kids and I worked outside? What has your sweetie done recently that went right to your heart? You can follow Yes, They Are All Mine on Facebook! If you are feeling really sweet and lovely, you can also check out and “Like” my Facebook page for my Handmade Goat Milk Soaps. I think that the “101 Reasons I Love My Husband” posts are my favorite to share with you. It would never be possible for me to relate to you the amazing man God has guided and lovingly molded Mr. Muscles into. I can only give you glimpses into little moments that make my heart flutter just thinking about them. Recently we watched a commercial that played Sitting on the Dock of the Bay as its background music. I commented how much I like that song. Just hearing it makes me relax, close my eyes, and picture myself stretched out in a lawn chair soaking up the sun. Cue the next week when I finally take the time to sync up my Ipod. What do you think I heard when I plugged in? Oh yes! Otis Redding was serenading me with Sitting on the Dock of the Bay. I love that Mr. Muscles does that. I didn’t even see him on the computer downloading the song to Itunes. He just loaded it and waited for me to hear it. Now when I hear that song I smile for two reasons: the thought of relaxing and soaking up the sun, and because Mr. Muscles just wanted to make me happy. How can you not just love that?! Let me tell you what my man did this weekend. He organized every bit of bathroom toiletries, medicines, bandaids, supplies and anything else that was in the bathroom and laundry room. At one time I had everything organized into labeled tubs, but that had gotten messed up over time. He threw out anything that was out of date, wiped leaked out medicine off of the bottles and tubs, reorganized it all even more and pared down enough to give me 2 tubs and some baskets to use elsewhere. Doesn’t it just make your heart go pitter pat?! It does mine! What do you love about your man? How do I know that the Civil War cake I made for Young Man falls into the range of coolness? Specifically he said, “Wow! Cool!”. I made one 10″ pan and two half ball pans. I trimmed the half ball cakes so that they would follow the outside edge of the cake and so they would not look like perfect domes. A dollop of my buttercream icing secures each one in place on top of the 10″. Notice I gave one hill something of a face, or “drop-off” edge while the other eases down. I prefer things not to be too neat. I colored the rest of my icing green and did a good crumb layer over the whole thing. 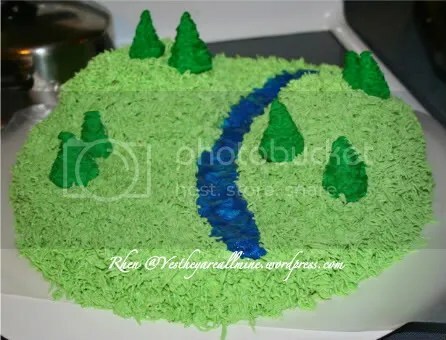 After giving it just a little time for the buttercream to set a bit, I covered the rest of it in grass. This part took the longest of the decorating. I stopped a few times to give my hands rest. I gave the stream a little bit wider of a bed than it was actually going to take up. After I applied the edible gel, and swirled it a bit with a spoon to make it look more like water, I then went along the edge with the grass tip so the stream would be blended in. 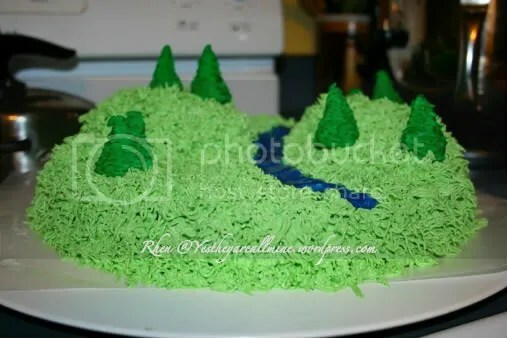 I made the trees out of fondant. Simply roll it in a general evergreen tree shape (cone), and then, use a pair of scissors to cut into the trees from the top down. This will create the look of boughs or branches. Do not go in straight lines down the tree. Try to be a little sporadic. It looks a lot better. I used toothpicks to secure the trees in place. Lastly, I added little Civil War soldiers. I bought these at Hobby Lobby and they are the perfect size as they are for dioramas. They are the only decoration that was not edible. He was able to keep these for the diorama of a Civil War battle he will be building for history. Bonus! There ya go! 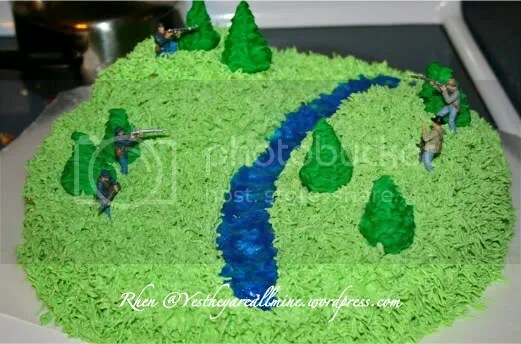 An easy civil war cake. 🙂 Happy decorating! It has been a little while since I posted anything in the 101 Reasons I Love My Husband category. *sigh* Its about time, don’t you think?! Early, early, early in the morning, despite my morning breath, crazy hair, tenancy to be a bit startled when woken up and crazy-sleeping-mom look, he still tells me goodbye, that he loves me and gives me a kiss every single day.